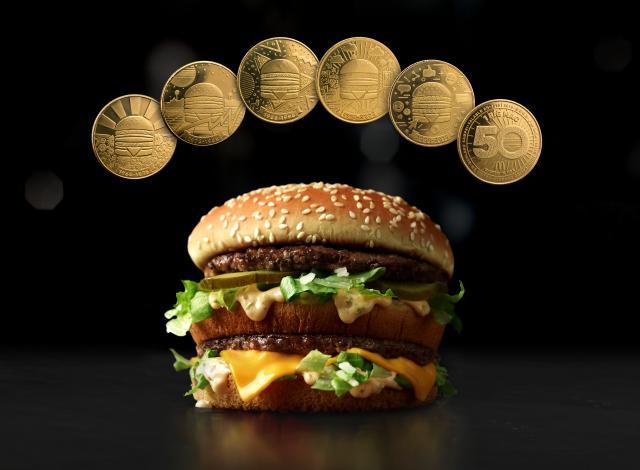 McDonald's commemorates the 50th anniversary of their iconic Big Mac by offering limited-edition MacCoins that they're calling "global currency backed by the internationally iconic Big Mac" (translation: each coin can be redeemed for a free Big Mac). You can get a MacCoin with the purchase of a Big Mac starting at lunchtime on August 2, 2018, at 14,000 participating locations in the US, while supplies last. In case you don't want to hold on to them, starting August 3 through the end of 2018, you can redeem each MacCoin for a free Big Mac at participating locations in the US as well as over 50 other countries. McDonald's has distributed over 6.2 million MacCoins worldwide. The collectible coins feature five different designs, each representing a different decade that the Big Mac has been in existence. - The '90s "Bold, abstract shapes"
- The early '00s - Emerging and popular technology at the beginning of the new millennium.